I've wanted to watch Rebecca, Hitchcock's adaptation of du Maurier's classic book, for ages. Finding a copy was almost as difficult as convincing Lady Gaga to wear sensible shoes. Library? Nope. Blockbuster? Negative. Netflix? I don't think so, Mister. Then Tasha informed me that you can stream the whole thing on YouTube. Can you believe it? It's like the ruby slippers: I had the ability the whole time but didn't know it. I immediately set up a playlist for it. It was worth the wait; I was not disappointed. 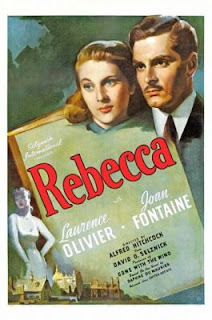 Although Hitchcock and Selznick butted heads during filming, I think Selznick was right to keep as close to the book as possible (the exception being Rebecca's death). As a long time fan of the book, I can't imagine the story any other way. It's perfect just the way it is. Laurence Olivier plays Maxim de Winter who falls in love and marries with a meek Joan Fontaine, the unnamed heroine. After the wedding on the Riviera, Maxim brings his bride home to Manderley, the estate he lived on before the death of his first wife, Rebecca. Joan's character spends most of the film simultaneously being patted on the head and yelled at by Maxim until she gets some balls towards the end of the film. The greatest character of the film is Rebecca, though she is never seen, her presence is everywhere. The new Mrs de Winter feels that she can never fill the designer shoes of Rebecca and fails to see the truth behind people's fascination with her. Mrs Danvers. Lock your doors. Mrs de Winter is to blame for her own insecurities but she's not helped by an uncommunicative Maxim and an obsessed Mrs Danvers, Manderley's housekeeper. 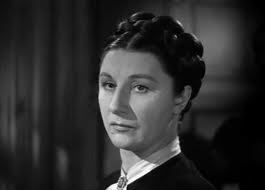 I admit I had a different picture in my mind for Mrs Danvers but Judith Anderson played it perfectly. She's a tall imposing woman with a proud face. I could see anyone being intimidated by her. She's totally creepy as Mrs D.
I loved how deliciously gothic the film was with the foggy landscape and dark Manderley with its huge rooms. And there are some awesome hats worn in the movie. This is a must see! That movie poster makes it look like she's got her head stuck through a book, and it's hanging like an albatross around her neck. Maybe it's supposed to be symbolic? It looks mighty uncomfortable. I saw Rebecca for a film class when I was in college. Loved it. Recently, I saw The Uninvited with Ray Milland and it reminded me a lot (in style) of Rebecca. The Uninvited is also a ghost story involing a mansion by the sea. I loved this movie (and book) so much. This is my favorite Hitchcock. Oh I loved this movie too. I thought the casting and directing was just perfect. Jill- I know that poster is cringe worthy. You think they would have put some effort into it. Ti- Oh, I must look for that one! Heidenkind- I hope you guys enjoyed it after I left! Amanda- It was! Can't imagine it any other way.